A novel where Earth is conquered by a group of aliens. The highest tier aliens that run the whole show are blue frogs. We humans fight alongside a lizard species and centaur species. One of the main characters is an American ranked as a Jemidar Major. The story is not young adult. Tone is severe and brutal. 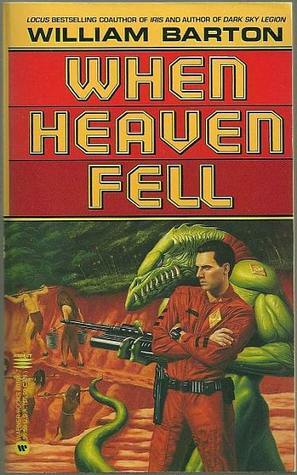 When Heaven Fell (1995) by William Barton? In the 22nd century, Earth has been subdued by a cybernetic master race, humans are slaves, collaborators, or, like Athol Morrison, mercenaries. For 20 years he has been conquering in the name of the master race. Now, upon his return to Earth he must make a decision: die betraying his masters or live betraying his dream. Jemadar-major Athol Morrison takes up with his high-school girlfriend, in the shanty-town remnants of Chapel Hill, NC. She turns out to be involved with a half-assed Resistance cell. Athy turns them in, but manages to save her from execution (or worse). Athy's really a pretty decent fellow, for a slave-army mass-murderer. What choice does he have? The Resistance play-actors were about to be picked up, anyway. There are plenty of other mercenaries ready to take up his work, if he loses the taste for it. And rebellious worlds are exterminated, if they become too troublesome. He's a moral person, making difficult but reasonable choices with the hand he's dealt. I first went for book "jemidar major" but that didn't yield anything relevant; then, Googling jemidar wiki (as I didn't know what a Jemidar was) gave me the Jemadar page on Wikipedia; I modified my query accordingly. When Heaven Fell (1995) by William Barton. Earth has been taken over by the Master Race, a galaxy-spanning empire of artificial intelligences, and the best of Earth’s survivors are recruited into the aliens' army. Athol Morrison has served for 20 years, and heads back to Earth for a brief vacation. There, he runs into old friends, and finds it easy to give into his old feelings with his childhood girlfriend, Alexandra (Alix) Moreno. And chapter one mentions the blue frog like master race. Shells came whistling down, ruddy, garish explosions lighting up the hillside, making the ground vibrate under my boots. Shrapnel from a nearby hit came buzzing through the air, making little ticking sounds as it bounced off my armor. There were about a million of them waiting out there, the flower of their warlike nation, armed to the teeth, as dangerous as anything this world had ever produced. And, of course, the full muster of a standard Spahi company is 256 effectives, officers, noncoms, and troopers together. You had to feel sorry for the poor bastards. The invasion had been going on for almost a week now, and they knew what was coming. Somewhere up there, beyond this tawny and dust-filled sky, an armed warship of the Master Race floated in orbit, bearing its cargo of software and little blue poppits, the beings who’d conquered us all. Old stories always imagine alien monsters, invaders from beyond the sky. Mighty beings, larger than men, fanged monstrosities. It’s what we thought the Kkhruhhuft were when they came. Only later, when we were already humiliated, did we discover they were no more than servants, slaves really, of the… intelligences who called themselves the Master Race. Not the poppits, little blue things the size of frogs, frogs with the behavior patterns of ants. Not them at all. Somewhere. Somewhere far back in time, the little blue frogs built anthill cities, hives that grew more complex and more complex still. Hives without mentality that evolved machines, machines that made more machines, machines that learned, slowly, ever so slowly, how to think. You have to wonder just when, and why, the mechanical servants of those nonsentient little blue frogs decided to call themselves the Master Race. A master race that would then go out and conquer the universe. Found with the Google query "novel" earth conquered alien frogs which revealed this story-identification post: What is the name of this sci-fi novel with a male soldier and a lesbian lizard sidekick? Not the answer you're looking for? Browse other questions tagged story-identification novel or ask your own question. What is the name of this sci-fi novel with a male soldier and a lesbian lizard sidekick?